SAS International is the world leader in the design and manufacture of performance based airport metal ceilings. Established in 1968, SAS has supplied a number of leading airports with a range of suspended ceilings, metal ceilings, acoustic rafts, ceiling discs and architectural metalwork products. Our relationship with specifiers, contractors, developers and clients are based on trust, respect and understanding. Our approach to projects is different, our range of products are flexible resulting in solutions to meet any application requirements. We endeavour to ensure that our commitment to product quality delivers inspired innovative solutions to issues of performance, aesthetics and budget, resulting in customers and construction projects receiving maximum value. 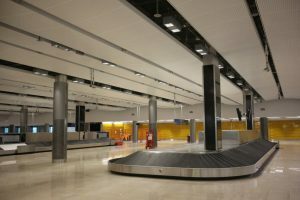 SAS International’s range of performance airport ceiling solutions includes a range of suspended metal ceilings. A number of different ceiling systems, meeting project demands, can be specified and installed from linear tubes to large soffit lining mega panels. Airport design requires a tailored approach to be taken to different projects. Using the latest manufacturing technology ceilings can incorporate a range of finishes including different coloured polyester powder, fine textured, wood effect and bespoke printed imagery. Complementing the range of metal ceilings, SAS International can design and manufacture a range of suspended ceiling rafts and ceiling discs. The rafts can feature curved bullnoses, formed using the latest folding technology, this stops dirt and dust gathering and provides ease of cleaning. Rafts can be designed with swing down panels providing access for any essential maintenance to services behind. Forming a dramatic architectural statement ceiling discs are suspended from the soffit and can create the appearance of floating in space. Complementing the range of ceiling systems SAS International can design and manufacture a range of performance wall panelling. 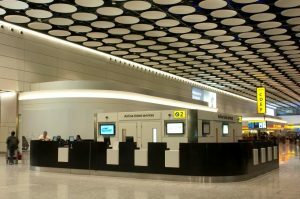 At BAA London Heathrow large perforated acoustic mega panels provide the necessary acoustic properties required for this vast open space. The very fine 0.7mm perforation, with 1% open area, helps to manage acoustics within large open spaced terminals. A range of specialist airport architectural metalwork can be designed and manufactured. The range includes column casings, bulkheads, binnacles, solar shading and daylight reflectors. 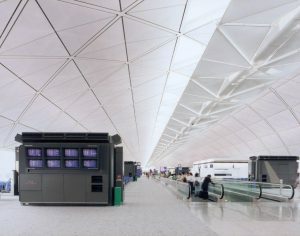 At Chek Lap Kok airport, Hong Kong, a range of architectural metalwork was specified including a 4km daylight reflector. At 6 metres wide it reflected sunlight around the vaulted ceiling and acted as a service gantry to facilitate maintenance of the lighting systems, loudspeakers, CCTV, smoke/fire detection and other services.